He spoke amid speculation about the consequences of last week’s rejection of Mrs May’s Chequers proposal by EU leaders in Salzburg. One report claimed senior aides had discussed having a general election next month, in which the PM could propose a harder Brexit – and at the same time head off the immediate threat of a coup to oust her. 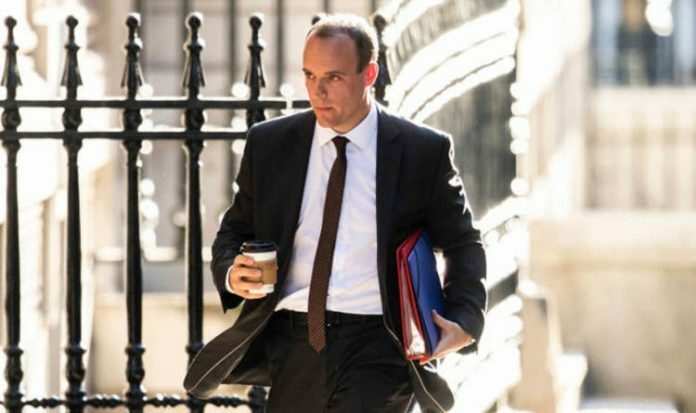 Mr Raab told BBC One’s Andrew Marr Show: “It’s not going to happen. We will hold our nerve, we will keep our cool and we will keep negotiating in good faith. “What we are not going to do is be dictated to. “The UK is one of the biggest economies in Europe, if not in the world. “We have come up with a serious set of proposals. We are not just going to flit from plan to plan like some sort of diplomatic butterfly. “We are going to be resolute about this.